A super-convenient, stylish camera backpack. The National Geographic Walkabout Rucksack for DSLRs and CSCs offers a smart, fuss-free solution to carrying all your essential kit. This bag can hold a CSC plus 2 additional lenses, or a DSLR kit, along with extra accessories, so you’ll always have everything you need close to hand when you need to travel light. Inside, you’ll find padded, removable dividers which effectively lock your camera and other gear in place, and you can tweak them to organise everything in the best way for you. Alternatively, you can hold a DJI Mavic Pro kit if needed. And if you need to transform this camera backpack into an everyday bag, you simply remove the dividers and you’re ready to go. 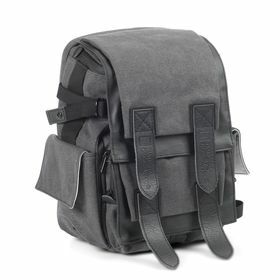 This clever bag has a separate compartment for your tablet or 13” laptop, helping you stay connected and keep your essentials safe wherever you are. The side pockets can carry a tripod, giving you extra creative possibilities while on location. Made from breathable, high quality materials, this bag will always stay ventilated and safeguards your expensive equipment from humid weather conditions.